Last night, as promised, I installed Windows 10 on my own personal laptop. I left everything to chance. I didn’t back up my data. Hell, I set my Lenovo ThinkPad X240 on the floor of a pizza parlor in San Francisco—dongle and all—and let it install totally unattended. Then, I woke my precious laptop to discover the most painless software upgrade I’ve ever performed. At least, that’s what it feels like so far. I’m going to be honest: I wasn’t expecting my ThinkPad to be a particularly easy target for a Windows 10 upgrade. I originally picked this computer because it’s absolutely jam-packed with features, some of which require additional software. It’s got a fingerprint reader, a touchscreen, two batteries—one of them removable—a touchpad with five integrated buttons and multitouch gestures, plus the famous red “Thinkpad nub” in the center of the keyboard. When I upgraded this laptop from Windows 7 to Windows 8 a while back, it was painful to go out and find all the drivers again to get those things working, and one of them never quite did: the fingerprint reader would probably work one out of every three times I tried to use it, and stop working until the next reboot every time it failed. But when I booted up Windows 10 for the first time, it just worked. I lifted the lid of my laptop, dragged my fingertip across the reader, and I was recognized then and there. You have to understand I’d done absolutely nothing to this computer except start the Win 10 installation, say “yes, I’d like to migrate all my settings and apps,” and let it sit for an hour while I ate pizza. There weren’t a whole bunch of “Yes, I’d like to verify such and such” screens to click through, and I didn’t need to let it sit and download drivers before I booted up. It really did migrate my existing settings—right down to the fingerprints I’d registered with this computer a year ago—and it worked better than ever before. Of course, that’s when Windows told me it wasn’t actually done installing and spent another 10 to 15 minutes “getting my desktop ready for me.” But still. When I picked up my ThinkPad for the second time, I was impressed yet again: there was my desktop, almost exactly the way I left it. All my files in the exact same places, and with my same background image. The second thing that bugged me: my overcrowded new taskbar. I tend to pin a lot of apps and shortcuts to my taskbar, and that meant that all of a sudden I had two pages of taskbar rather than one. And since Skype launches itself whenever I start Windows—and freshly launched apps appear on page two of that taskbar—all of a sudden I couldn’t see my most used programs. I decided that might be a minor gripe, though, when I saw what was crowding the taskbar: four new options. The Start Menu, Cortana, a dedicated multitasking key, and a little speech bubble of a button that brings up the Action Center, a hub for settings and notifications. Yes, the Start Menu is back, and I’m so relieved. As you might have heard, it’s got two halves now. The left half (supposedly) gives you six of your “Most Used” apps, a few of the most recently added apps, and quick shortcuts for settings, your file browser, and finally restores the goddamn buttons that actually let you turn off your freaking computer. It also brings back a simple scrollable/swipeable alphabetical-sorted list of all your apps, which is absolutely amazing for me, personally, to have. I’m always forgetting the name of the app that lets me see which gigantic files are eating up my computer’s hard drive space—for example—and of course you couldn’t easily search for an app in Windows 8 without knowing its name! Now, I can just flick through the list, find WinDirStat, and go about my business. The right side of the Start Menu, meanwhile—which you can actually stretch out to be far wider—is the place where you can pin don’t-call-them-metro Windows Store apps, complete with their flashy animated Live Tiles that pop up information at a glance. But I didn’t have time to check that out last night—because that was the moment Windows 10 decided to try installing some new drivers without asking me. All of a sudden, the brightness adjusting keys on my keyboard started working. Great! And all of a sudden, my desktop was ripped to shreds when the Intel graphics driver crashed. Not so good. I swiped in from the right edge of the touchscreen—like Windows 8 taught me—to turn off the computer. The power buttons weren’t there. And for some reason, my Windows key wouldn’t summon the Start Menu. Oh boy. Would my Windows 10 experiment end in failure? Nah. I stabbed at the little Windows key right there on my touchscreen, managed to hit the power button, and restarted the system. When it woke up again—which seemed to take forever, probably because it was installing mandatory updates, though weirdly the screen stayed blank—everything was back to normal and everything seemed to be working again. In fact, nearly every one of what I’d presumed were proprietary Lenovo function keys were being properly mapped to a Windows 10 feature. The Search key pulled up the new Cortana voice assistant, and the settings key launched the new Windows settings menu. Only the hardware wifi switch doesn’t seem to do anything (though now you can just say “Hey Cortana, turn off wifi” to do that instead). And yes, that multitouch trackpad, Thinkpad nub, and all five buttons worked as expected. They felt just the same. Hell, so many things felt so familiar that it wasn’t clear what to test next. Even the little hacks I felt sure wouldn’t migrate to Windows 10 appear to be there. My screenshots are still automatically uploading to Dropbox. My ImageMagick shell integration is still there. I clicked on the little battery icon in the system tray, and sure enough, both batteries were being detected and drained in the right order—the removable one first. Which is probably controlled by the ThinkPad’s low-level hardware, but it’s nice to see Windows natively recognize it and even tell me how long it’ll take to get to a full charge. I was about to call it a night when I noticed a new pop-up notification in the corner of my screen: Microsoft wanted to know how my upgrade process had been, on a scale of 1 to 5. Nice try, Microsoft. So far, so good—but we’ve just scratched the surface. Now, I’m going to actually work from this laptop, and see how Windows 10 holds up. This post is part of a week-long experiment with Windows 10 ahead of the official launch on July 29. 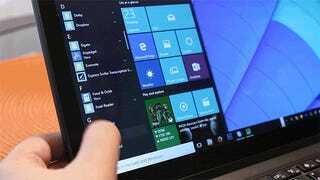 What do you want to know about Windows 10? Drop us a line.